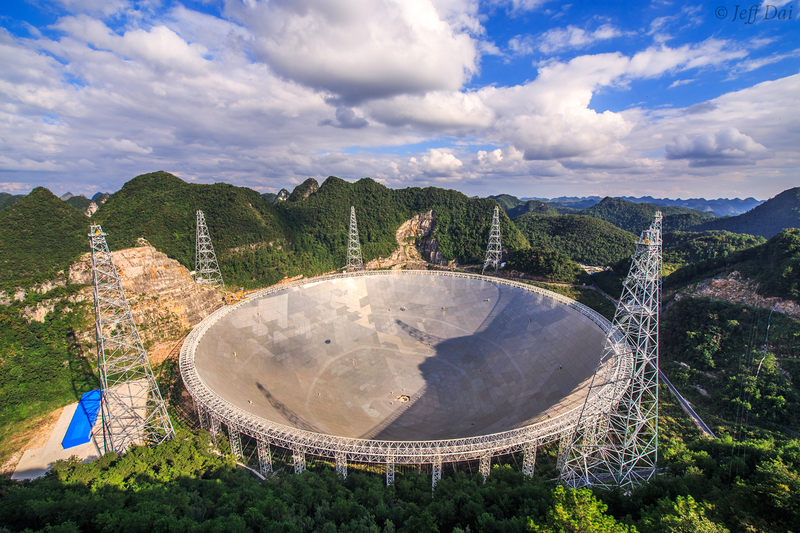 Explanation: The Five-hundred-metre Aperture Spherical Telescope (FAST) is nestled within a natural basin in China's remote and mountainous southwestern Guizhou province. Nicknamed Tianyan, or the Eye of Heaven, the new radio telescope is seen in this photograph taken near the start of its testing phase of operations on September 25. Designed with an active surface for pointing and focusing, its enormous dish antenna is constructed with 4,450 individual triangular-shaped panels. The 500 metre physical diameter of the dish makes FAST the largest filled, single dish radio telescope on planet Earth. FAST will explore the Universe at radio frequencies, detecting emission from hydrogen gas in the Milky Way and distant galaxies, finding faint galactic and extragalactic pulsars, and searching for potential radio signals from extraterrestrials.